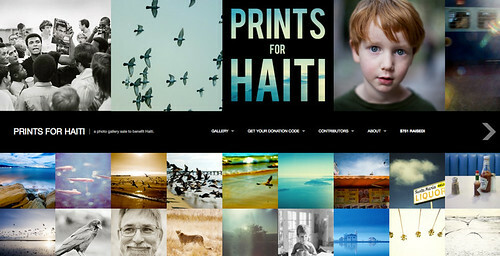 Prints for Haiti - a photo gallery sale to benefit Haiti, originally uploaded by zinkwazi. Richard Rohr wrote, “The deepest inscription in [a man] is to generate life in others.” And that can take many forms. Photography is an avenue in creativity that seems chalk full with generative life – we are moved by images, we are visual people. Some of the guys out of Brooks in Santa Barbara have decided to use their creativity with a lens to hopefully generate life for the ongoing recover work in Haiti. If you aren’t familiar with the Brooks Institute, you might be familiar with work from their various teachers and former students. Most everything I’ve learned about capturing images, and moments on digital or analog film has come from some of these guys. This past week a project was started at http://www.printsforhaiti.com. You can purchase high quality prints and in return everything after the $10 cost for S&H gets split between the American Red Cross and Direct Relief International. So, buy a $100 print, $90 goes to Haiti and you get some outstanding work to hang on a wall, a small piece of generative life – in more ways than one. Oh, and The Brooks Institute has decided to match every dollar up to $5,000. In keeping with the deepest inscription to generate life for others I have donated 4-5 of my favorite Holga shots from the past few years. DMIACAST interviewed Gabriel Cano about the Prints for Haiti project. You can listen: HERE. (Thanks DIMA host @Bmundy for donating to the Project via your iphone app sales.